Oh boy another Aqua Surf Swap! lots o' folks have been asking for a Swap in the Fall to get ready for our season- so here it is! This is a perfect chance to get the supplies you need for the upcoming season. Buy, sell and/or barter used surf equipment like outgrown wetsuits and underused shredsticks. Check the vendor booths for BIG deals while listening to live music and enjoying food/drink. For an idea of which vendors are there and where to set up your used equipment see map below. Note- Used Vendors- there is no cost! 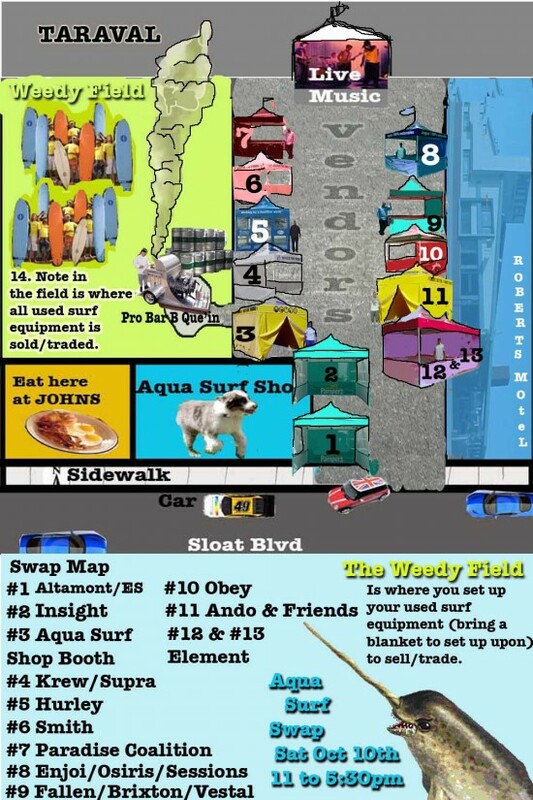 Just gather up your used surf/skate stuff, grab a blanket or some kind of ground covering to set your goods upon. Set up in the field (see map) and you have from 11 to 5:30 sell and trade away!